Value Research Online (VRO) is a reputed website that gives a rating to mutual funds. In addition to giving a rating, this website also helps investor by solving their queries. Mutual funds rating of value research online is widely accepted. Mutual Funds with 5-star rating by Value Research online is considered best for investment. In my previous post, I have already given information about Direct Mutual Funds concept and various Investment platforms available in India. 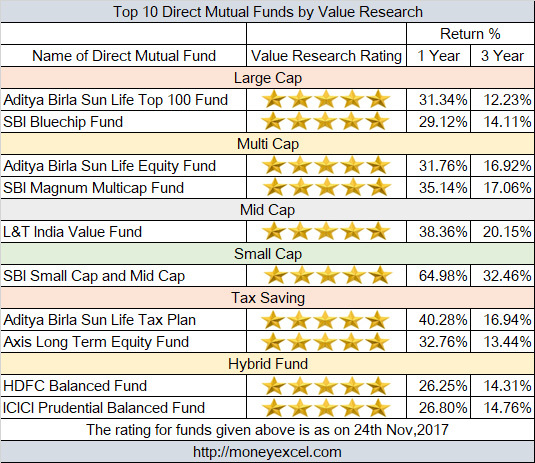 If you are DYI (Do yourself Investor) and looking for best direct mutual funds, here are Top 10 Best Direct Mutual Funds with 5-star rating by Value Research Online. What is Value Research Online? Value Research Online is a popular website that offers investment advice, analysis, and information via website and two magazines. Value Research Online also helps the investor in solving query related to mutual funds, fixed deposit, equity and other investment avenues. Value Research Fund Rating is composite score of fund based on risk and return. This rating gives summary of how fund has performed historically relative to peers. Value Research calculates risk score and return score of the fund based on various parameters. Fund rating is defined by subtracting risk score from its return score. Fund Objective – Objective of this fund is to provide medium to long-term capital application by investing in large-cap equity and equity-related securities. Fund Performance – Aditya Birla Sun Life Top 100 Fund has given 31.34% return in last one year. Last three years return of this fund is 12.23%. Fund Objective – SBI Bluechip Fund invests in blue-chip companies with substantial market share and leadership in respective industries. This fund is suitable for the investor who wants exposure to blue-chip Indian companies from medium to long-term perspective. Fund Performance – SBI Bluechip fund has given a very good performance to the investor. Last year this fund has given 29.12% return to the investor. Last three years return of this fund is 14.11%. Fund Objective – The prime objective of this fund is capital appreciation and regular income through 90% investment in equity and 10% investment in debt and money market instruments. Fund Performance – Aditya Birla Sun Life Equity is one of the star performers in direct plan category. This fund has given 31.76% return in last one year. Last three years return of this fund is 16.92%. Fund Objective – It is a multi-cap fund. The prime objective of the fund is to invest 50-90 % in large-cap stocks, 10-40 % in mid-cap stocks and up to 10 % in small-cap stocks. Fund Performance – The performance of this fund is magnificent. This fund has given 35.14% return in last one year. Last three years return of this fund is 17.06%. Fund Objective – The objective of this fund is long-term capital appreciation by making an investment in undervalue mid-cap stocks. It could also invest in foreign securities in International market. Fund Performance – Last year this fund has given 38.36% return to the investor. Three years return of this fund is 20.15%. Fund Objective – SBI Small Cap and Mid Cap Direct Plan primarily invest in Small and Midcap equity and equity related securities of the companies in the small and midcap segment. This fund is suitable for investor with high-risk appetite. Fund Performance – This fund has given very good performance last year. One year return of this fund is 64.98%. Last three year performance of this fund is 32.46%. Fund Objective – Aditya Birla Sun Life Tax Plan is ELSS with an objective to achieve long term growth of capital along with tax saving for investor. Fund Performance – Last year this fund has given 40.28% return to the investor. Three years return of this fund is 16.94%. Fund Objective – Axis Long Term Equity Fund invests in companies with strong growth & sustainable business model. The main objective is to generate long term capital growth. Fund Performance – This fund has given very good performance. Last year this stock has given 32.76% return to the investor. Last three years return of this fund is 13.44%. Fund Objective – The prime objective of this fund is to invest in equity and debt related instrument for long term capital appreciation. This fund is suitable for conservative investors. Fund Performance – The performance in this category is somewhat low. Last one year performance of this stock is 26.25%. Last three year performance is 14.31%. Fund Objective – Long term capital appreciation and regular income generation by investing in equity and debt instrument. 60-80% investment is done in equity and remaining 20% in debt. Fund Performance – Last year ICICI Prudential Balanced Fund has given 26.80% return. If we look at 3 years performance fund has given 14.76% return.